BBC NEWS | In Depth | Who will succeed John Paul II? Who will succeed John Paul II? The end of John Paul II's papacy sets in motion the centuries-old ritual of electing a pope. While this election is genuinely wide open, it is possible to identify some key players. Cardinals from all over the world are summoned to Rome for the secretive process and the new pope is almost certain to be drawn from their ranks. Click on the names below to learn about some powerful figures, including archbishops of major cities and the heads of Vatican departments. 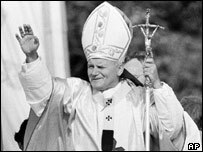 In 1978, the election of the Polish-born Karol Wojtyla brought to an end a line of Italian popes stretching back four-and-a-half centuries. So one of the big questions this time round is whether Italy will get the papacy back. Many Vatican watchers are far from convinced they will, for the simple reason that the proportion of Italians in the electoral body has declined in recent years. Much more likely, they believe, is that the next pope will be from the developing world - and most likely from Latin America, whose cardinals now form a powerful voting bloc. Because of the mathematics of the voting system, the winner is likely to be a middle-of-the road cardinal, rather than someone with extreme views. Cardinal Francis Arinze is a Nigerian who has long been regarded as a serious contender. He heads the Vatican's Congregation for Divine Worship and the Discipline of the Sacraments, which reviews liturgical texts. If a black pope is to emerge from this conclave, he probably has the best chance. Cardinal Giovanni Battista Re is an Italian who is highly rated for his administrative skills. After a successful career as a church diplomat, he became a key adviser to John Paul II. He now heads the Vatican department that appoints bishops. Cardinal Jorge Bergoglio the Archbishop of Buenos Aires, is a 68-year-old member of the Jesuit Order. He is a trained chemist and son of a railway worker, who lives in a modest apartment, does not have a car, and gets around town by bus. But there has never been a Jesuit pope before. Cardinal Godfried Danneels of Belgium might appeal to voters who want to see less power centred on Rome. His views are regarded as middle of the road. On sexual morality, he says the church cannot change its fundamental principles. Cardinal Ivan Dias the Archbishop of Bombay, is one of 11 Asian cardinals eligible to vote in the conclave. He is in his late 60s, and had a long career as a Vatican diplomat before returning to his home city. He has travelled widely, and was papal nuncio in Korea and Albania. He is increasingly mentioned as a strong candidate from the developing world. Cardinal Claudio Hummes could be one of the dark horses of this race. As Archbishop of Sao Paulo in Brazil, he is a member of the increasingly powerful South American bloc that now makes up almost one-fifth of the electors. Now aged 70, he is about the right age. Cardinal Jean-Marie Lustiger stepped down in February as Archbishop of Paris, at the age of 78. He converted from Judaism at the start of World War II and was close to John Paul II. His age could be a problem. Cardinal Oscar Maradiaga of Honduras has emerged as another contender from Latin America. He supports debt relief for poorer countries and, if elected pope, would see one of his tasks as addressing the conflict between the global economy and the millions who live in poverty. Cardinal Carlo Maria Martini is the 78-year-old retired Archbishop of Milan. Until recently he was considered by most experts to be out of the running but appears to be making a comeback. He is popular with Italian liberals, but his age, his poor health and his progressive views are handicaps. Cardinal Wilfrid Napier of Durban, is a South African archbishop of mixed race origin. He has been described as charismatic but conservative and favours decentralising power within the Church. At the age of 64 he is one of the younger cardinals, but not "too young". Cardinal Jaime Ortega the 68-year-old Archbishop of Havana, was interned by the Cuban government in a labour camp in the 1960s. He is considered a moderate, but would be acceptable to the conservative wing of the Latin American church. Cardinal Francisco Ossa the Archbishop of Santiago, Chile, has recently begun to be discussed as a possible candidate for the papacy. Aged 71, he is president of the Latin American Bishops' Council, and is considered a conservative. Cardinal Jose Policarpo aged 69, the Patriarch of Lisbon, a liberal, has been described by Italy's La Repubblica newspaper as a "silently rising star" in the papal stakes. The paper describes him as someone who could mediate between European and Latin-American cardinals. Cardinal Joseph Ratzinger heads the Vatican department once known as the Holy Inquisition, and his views could be very influential. A theologian from Germany, his job has earned him the nickname of "the Pope's enforcer" and he has been accused of trying to silence church dissidents. Cardinal Norberto Rivera Carrera is the Archbishop of Mexico City, and runs a huge diocese of 19 million people. He is active on social issues, and has spoken out on human rights. Born in 1942, he is perhaps a little young to be considered a serious contender this time round. Cardinal Camillo Ruini the Auxiliary Bishop of Rome, aged 74, is a leading conservative force within the Italian Church and president of the Italian bishops' council. Some observers see him as a kingmaker more than a candidate in his own right. Cardinal Christoph Schoenborn is Archbishop of Vienna, and a rising star. He is frequently mentioned as a future pope, although conventional wisdom says he is too young, at just 60, to be elected this time. After the lengthy papacy of John Paul II, the conclave may look for an older cardinal, who will not live so long. Cardinal Angelo Scola the 63-year-old Patriarch of Venice, has only been a cardinal for two years, but Milan's Corriere della Sera newspaper has said he was the choice of John Paul II. He speaks several languages, but his links to a fundamentalist grassroots movement may not be in his favour. Cardinal Angelo Sodano was John Paul II's Secretary of State, the head of the Vatican bureaucracy, including its finances. This gives him a strong power base, but his pastoral experience is limited, and at 77 he may be too old to be chosen as pontiff. Cardinal Dionigi Tettamanzi, the Archbishop of Milan, may now be Italy's best chance of regaining the papacy. Regarded as a moderate conservative, he could be a consensus candidate. The bookmakers have made him one of the favourites, but that may count against him. According to an old Vatican saying, "he who goes into the conclave a pope, comes out a cardinal".